It is Festival time again over at Amy’s Creative Side. After the quilt was made back in 1998, people were constantly asking: How did you come up with this idea? Keeping track of my creative process, and then explaining it afterwards, is not at all easy. The process is for the most part visual, and does not translate well into words. Words as such come into play only as long as they trigger mental pictures. It started as a brainstorming for a special log cabin quilt I wanted to make, – something that would be a bit different from just ordinary log cabin. I had been into three dimensional folding techniques for a while, and was pondering if three dimensional pieces could be added to the quilt somehow. I had also just read, and immensely enjoyed, Antonia Barber’s book about The Mousehole Cat. I loved the illustrations, and many of them were mainly in blue greens, which are my favourite colours. Mowser the cat helps save the starving village “Mousehole” by pacifying the Great Storm Cat so his human can land a catch of fish. Afterwards they celebrate with “Stargazey Pie”. Just from this last word a lot of associated pictures came to mind: yellow stars gazing out of a velvety blue sky, the oval bluish fish peeping through the golden pie crust, the pie shape in my quilt design program which easily makes a melon patch block when doubled and flipped over. I had also flowers in mind. They are always appealing, and the Stargazey-Pie-word made me think of the flower called “Night and Day”, a small pansy-like flower with dark violet-blue and yellow petals. I wanted to make a quilt which would remind me both of this flower and the starry night sky. But how? I was finally able to visualize log cabin blocks surrounded by flower petals, a yellow centre, something orange and pink folding out onto a blue-green background of leaves. Yes – I could make that happen by alternating the colours of the blocks and let the petals be three dimensional., standing out from the surface. Could I make the petals open and close? – that would be fun. What would the quilt look like with closed petals? Very green, perhaps, because then the petals would cover the yellow centres. And maybe it would be boring if all the yellow disappeared behind the green leaves. Could I make the leaves more blue and put in some yellow spots for stars somehow? The Stargazey word had not left my mind yet, and since the flower petals close at night, the quilt ought to look sort of “nighty” with the petals closed. What if the petals didn’t close completely, but let some of the yellow flower centers show through? Cut holes in them? Yes, that was definitely a possible solution. But when the petals opened again, then the blue-green would show through on the orange-pink side of the petals, – well, so what? The holes could be leaf- shaped, then they would fit nicely with the flower theme. How could I make the holes in the petals look nice? I did not particularly fancy raw edges at the time. Passepoils? Too much work, and I might not get them to be flat. Cut the petal in half and curve the two adjacent edges? That would be sort of cheating, but it might work well. Curve the edges?????? That’s it!!! Curve the edges of the petals themselves, and there will be no need for holes or cutting in halves. The idea was too good not to try out, so I eventually sat down and drew a pattern and then sewed the quilt. I discarded the log cabin block and went for a block with straight diagonal seams instead. All the time I felt so smug when thinking about my quilt which would be able to change between two looks: open petals and closed petals, and at this stage I had also figured out that I needed loops and buttons to hold the petals in these two positions. As I had joined the blocks into rows and was sewing the rows together, the three dimensional petals wobbling this way and the other while I was sewing, I suddenly realized that my quilt would have more than only two looks. In fact, there were so many possible combinations, I was not able to figure it out. An internet acquaintance, who happened to be a computer engineer as well as a quilter, helped me figure out the number. The triangles, or petals, can be buttoned in an unbelievable 1 152 921 504 606 846 976 possible combinations. The number is so huge I did not even know how to say it, and I bet many of you do not know how either. Out of this, “only” 512 combinations will make up a symmetrical and balanced pattern, which is still a lot more than the two I had planned. I probably should not reveal that this was a surprise to me, but rather do as the cat does after it falls off the window ledge: just walk away with a posture that says: “it was not an accident, I intended to fall all the time”. But I admit it, I did not plan all these combinations, they just happened! I named my quilt “Night and Day” after the flower, but a friend commented that it was just like a chameleon as it could change its look endlessly, so I also called it The Kameleon Quilt. With so many looks, it deserved to have more than one name. Later I have made more quilts using the same principle of the 3D petals or flaps, and then they were numbered Kameleon Quilt no 1, no 2, etc. They can all be seen on my website. I also made an animation to show how the petals, or flaps, turn and change the look of the quilt. I eventually wrote a pattern for the quilt, and also taught classes. It also hit the TV-screens during the last season of “Simply Quilts”. Here is our oldest grandson engaged in buttoning the flaps to change the quilt. 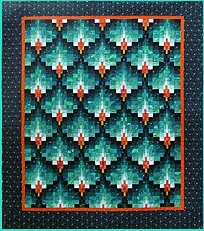 This quilt is entered in the “Original Design Quilt” category in the Bloggers Quilt Festival. Please head over to Amy’s site and check out all the other entries there. I spotted it as it was posted for sale at the website “Through our Hands”, and I could not believe my luck that it was still available when I came across it. I decided on the spot that this was going to be a Christmas present for myself, and hurried to buy it before someone else could snap it up from under my nose. It was made by UK artist Annabel Rainbow in 2011. If you visit her website, you will see that it is very different from her current work, which is absolutely fantastic, by the way. 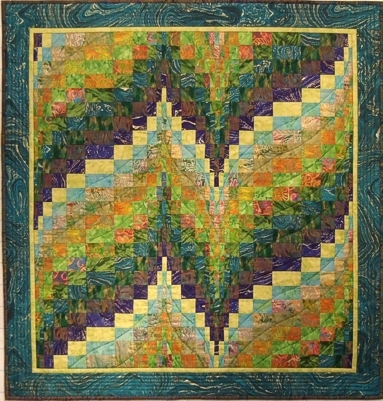 The quilt is approximately 58 cm square, each block is 6 cm, and it is made entirely of silk fabric. The centre is Cathedral Window blocks, surrounded by a row of Secret Garden blocks. Those of you who are familiar with the technique, will know that a lot of fabric goes into the creation of each block. It is hand sewn through and through. The borders have a pattern in reverse applique, with border fabric re-appliqued on top of the circles in every corner. The blocks all have a small pearl in the centre. The name of the quilt, “Hoc Sensu Modo”, is hand embroidered along the top border, and it means “This side up”. It is a gem, and I just love it. I finally got around to taking some half decent photos of the blue green bargello quilt. The quilt is approximately 82 x 92 inches, and is made from a pattern I wrote earlier. It was beautifully quilted by Anne Rønningen at Quiltekammeret. Here is a closer look at the quilting. 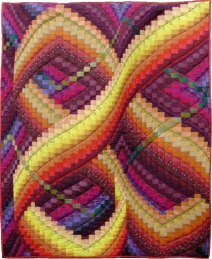 Bargello quilts are fun. As with all kinds of quilts there are a multitude of possible variations, and they also come together quickly, – at least the tops do. This one has just been finished. It was started last summer, so you may well ask what happened to the “quickly” part. The answer is that the last step, the binding, was put off and put off again, until quite recently. The delay was partly on purpose, so that I might also finish the pattern I have been writing for this quilt, so that they could be presented together. Many years ago, in 1997, I made the quilt above, and have been meaning to make another one which could fit on a bed. Now I have, although not all by myself. Anne Rønningen at Quiltekammeret has done a wonderful job with the quilting. 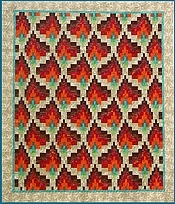 I think the flame like all over quilting pattern fit very well with the bargello pattern of this quilt. The pattern is available on my website as a downloadable pdf-file.